A Northwestern fencer prepares to attack. The Wildcats won their second MFC title in three seasons this weekend. 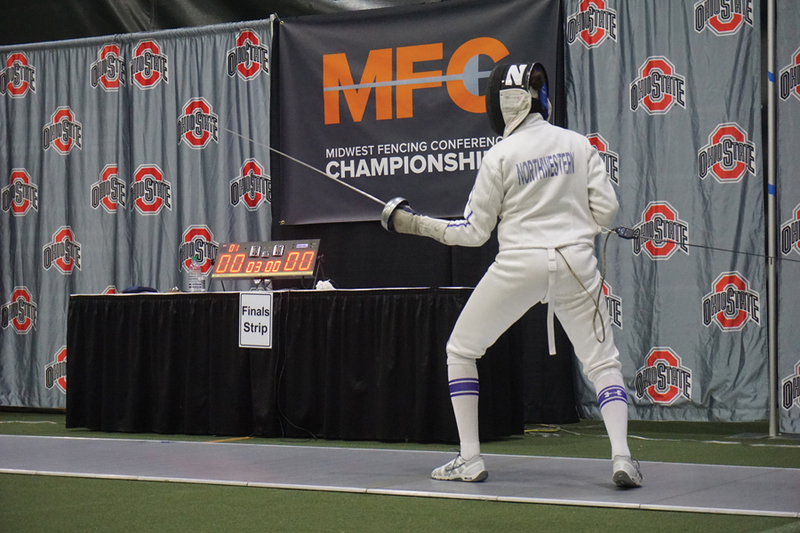 Northwestern was a point away from securing its second Midwest Fencing Conference championship in three seasons when junior foil Yvonne Chart was controversially called for a foul, tying the foil championship match at four. That left the foil team championship, and the opportunity to clinch the team title, up to freshman foil Justine Banbury. Banbury was going up against Ohio State’s Camilla Rivano, who defeated Banbury on the way to winning the individual foil title the day before. This time, Banbury reversed the script and picked up a close 2-0 victory to secure the Wildcats their fifth-ever MFC team championship. In addition to the overall team title, NU also won two squad titles and had two runner-ups in the individual tournaments. The saber squad picked up its first title since 2016 when they defeated Ohio State 5-3 in the championship, while the epee squad fell to the Buckeyes in their championship matchup. In the individual epee tournament, Van Riper tied with freshman Marta Amador Molina. Freshman Anya Harkness and junior Ella Lombard followed them in fifth and sixth place. In her semifinal matchup, Van Riper went up against Buckeye Emma von Dadelszen and fought hard but ultimately fell by a single point 15-14. Von Dadelszen ended up winning the event. As the seventh seed in the individual saber tournament, freshman Alexis Browne upset No. 2 seed Pati Palczynska of Wayne State in the quarterfinals and subsequently defeated sophomore Abby Tartell in the semifinals before losing a close battle 15-14 to defending champion Sarah Merza of Ohio State in the final. In the individual foil event, the Cats had 7 of the top 16 seeds in the elimination tournament, leading to multiple teammate-versus-teammate matchups. Coach Zach Moss said all members of the team did a good job supporting each other, even if a fencer was eliminated by a teammate. Two freshmen, Banbury and Sarah Filby, defeated two juniors, Chart and Sharon Chen, respectively in the quarterfinals to reach the semifinals. While Banbury fell there, Filby was the second NU fencer this year to make it to the finals in her first MFC championship tournament. Banbury said that one of her favorite moments of the entire weekend was watching the seniors celebrate the title. A previous version of this story misstated the third place results in the epee classification. Katie Van Riper and Marta Amador Molina were both awarded bronze medals. The Daily regrets the error.